A fiance is neither this nor that: he's left one shore, but not yet reached the other. Comments on: "Anton Chekhov Quotes: A fiance is neither this nor that: he's left one shore, but not..."
Any idiot can face a crisis; it’s day-to-day living that wears you out. The world is, of course, nothing but our conception of it. If a lot of cures are suggested for a disease, it means that the disease is incurable. To begin to live in the present, we must first atone for our past and be finished with it, and we can only atone for it by suffering, by extraordinary, unceasing exertion. A woman can become a man’s friend only in the following stages—first an acquaintance, next a mistress, and only then a friend. Anton Pavlovich Chekhov was a Russian physician, dramaturge and author who is considered to be among the greatest writers of short stories in history. His career as a dramatist produced four classics and his best short stories are held in high esteem by writers and critics. 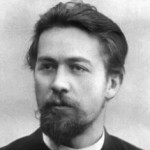 Chekhov practised as a medical doctor throughout most of his literary career: "Medicine is my lawful wife", he once said, "and literature is my mistress." Chekhov renounced the theatre after the disastrous reception of The Seagull in 1896, but the play was revived to acclaim in 1898 by Constantin Stanislavski's Moscow Art Theatre, which subsequently also produced Chekhov's Uncle Vanya and premiered his last two plays, Three Sisters and The Cherry Orchard.